International Day for the Elimination of Racism was founded in response to police opening fire and killing 69 people at a peaceful demonstration against apartheid “pass laws” in Sharpeville, South Africa on March 21, 1960. For more than half a century, March 21 has been recognized as a day to focus attention on working to end racism and heal its effects, but as last week’s mass shooting at two New Zealand Mosques demonstrated, the need for a day to call us to action throughout the year is just as important now as it was in 1960. This year’s prayer is written by the Moderator of the 2018 General Assembly, the Rev. Daniel Cho. 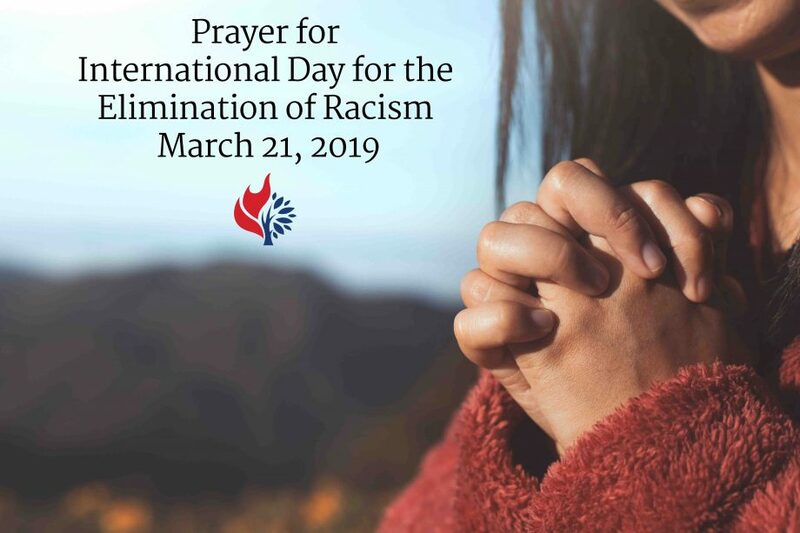 It calls us to prayer that we may eliminate racism not only outside in the world, where the need for healing is so clear, but also in our own hearts where too often we fail to see the way prejudices shape us. God of all nations, enliven our hearts in love on this International Day to Eliminate Racism. We thank you for a world community that is so vibrantly diverse. Yet we often inflict harm, insult, violence and injustice upon people simply because of our differences. We earnestly pray for a world where we can accept one another regardless of ethnicity, race, colour or background. Help us cultivate this kind of just world, one founded in peace where all are safe. O God, hear our prayer. God of all fellowship, sensitize our hearts to know that our words can injure and incite others to harm. Sometimes we insult, offend and judge while hiding behind the guise of a harmless joke or trivial comment. Other times our silence speaks volumes, causing communal wounds that are hard to heal. We humbly pray for the will and courage to confront our hushed prejudices and repent of our sin. Forgive us for our insensitivity and silence at racial inequity, and let us be spurred to more love. Help us cultivate this spirit in our hearts. God of all people, lead us to the conviction that racial prejudice is not only what thunders out in society but it can also hide quietly in the crevices of our heart. We faithfully pray that we would see people of all colours, creeds and cultures as your beloved children. Empower us by your healing love to embrace one another in Jesus Christ. Help us birth this vision in our lives and in the world. Through Christ and in Christ, and in the unity of the Holy Spirit we pray. Amen.